Kaname gets up at 05:30 to do her normal routine of getting the bathhouse ready for to be opened. Tsukasa shows up and offers her assistance. Kaname initially turns Tsukasa down. However, when Tsukasa smiles and states she’d like to repay her debt to Kaname’s family and get along with them, Kaname caves. Then, Kaname gets permission to address Tsukasa as Tsuka-san. Kaname shows Tsukasa what to do when it comes to cleaning. She also shows Tsukasa the things Nasa made for them. In Kaname’s mind, Nasa is basically Tony Stark. Kaname leaves Tsukasa to her work. When Kaname returns a little later, the bathroom sparkles. This amazes Kaname. Tsukasa expresses her admiration for Kaname doing all of this cleaning on a daily basis. The two head to the boiler room. Tsukasa is surprised to learn the bathhouse uses a wood burning furnace. Kaname informs Tsukasa of the upgrades Nasa made to the boiler to make it efficient. Kaname thanks Tsukasa for saving Nasa’s life. Tsukasa recounts what happened, including the fact that she was badly injured. But she too is glad she saved Nasa. Meanwhile, Nasa wakes up and misses his wife. He gets up and finds Tsukasa seeing Kaname off to school. Tsukasa offers to make Nasa breakfast. Meanwhile, Aya sees this and feels she is losing standing. 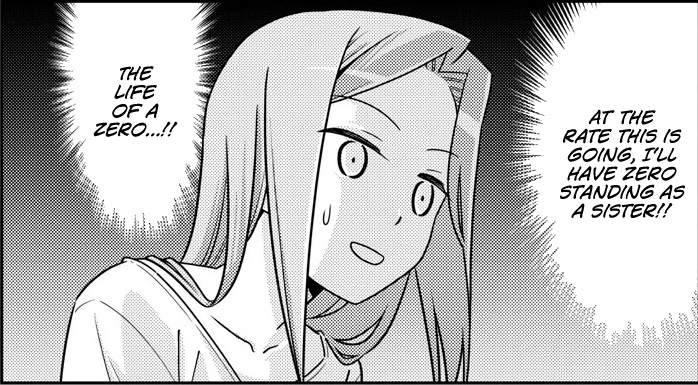 Tonikaku Cawaii chapter 39 is a lovely chapter featuring Tsukasa and Kaname. It also comes with some possible clues about the future. Because Kaname is often displayed as a pervert who likes to stir up things for her own amusement, it is easy to overlook her other attributes. As such, I liked how Hata-sensei shows just how hard Kaname works. Imagine getting up every morning at 05:30. Then you have to clean two giant bath rooms (male and female side), clean the rest of the bathhouse, make sure the boiler is going since it is wood burning, etc. And she has to get all of this done before going to school. Anyway, I also liked how Kaname thanked Tsukasa for saving Nasa’s life. 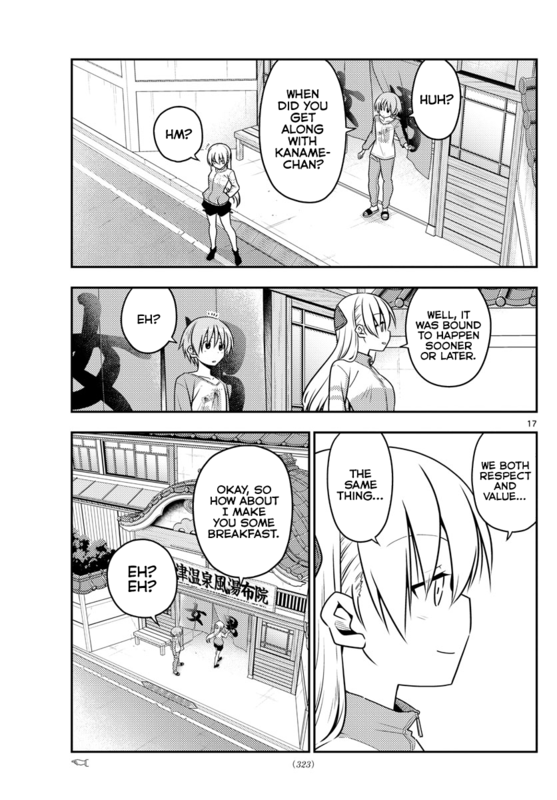 Although Nasa didn’t show up in Tonikaku Cawaii chapter 39 until the end, his presence was felt through much of the chapter. We’ve already seen how smart Nasa is. In addition, we’ve seen how financially smart he is. And we have seen some of his technical prowess when he built an old school style side scrolling shooter game on an old PC. Nasa modifying an old Roomba so that it would scrub bathhouse floors is pretty amazing. (Granted, it can’t get everywhere, which is why Kaname has to clean everything the robot can’t.) Then Nasa made a washing machine that apparently is fully automated. (Not sure what all it does, but it may also dry and fold towels). And finally, Nasa modified their boiler to be as efficient as possible. No wonder Kaname considers him to be a Tony Stark. All this being said, if the theory that Tsukasa is Kaguya-hime is true, and that she’ll be taken to the moon, then I can easily see Nasa building a craft to get him to the moon. Tsukasa continues to rack up all kinds of “perfect wife” points. For Tonikaku Cawaii chapter 39, this entailed her reaching out to Kaname and forming a bond with the girl. Tsukasa genuinely respects Kaname, and Kaname comes to understand and respect Tsukasa. This aside, the thing that stood out to me is Tsukasa’s version of her saving Nasa’s life. As she mentioned in her story to Kaname, Tsukasa took the full brunt of the truck’s impact. She injured her head and broke bones. I went back to chapter 1 and it is clear that Tsukasa is bleeding a lot. And she’s holding and arm at one point. After Tsukasa leaves the scene of the accident, it isn’t but a short time later that Nasa finds her in a bus shelter. However, not only is Tsukasa not bleeding, she shows no signs of having ever bled. Further, she shows no signs of injury at all, even though she had been injured. As such, I can’t help but wonder if this will become some future plot point for Nasa to question things about Tsukasa. This event also helped fuel the theory that Tsukasa is immortal, like Kaguya-hime. I’m losing sleep, so let me wrap up my review of Tonikaku Cawaii chapter 39. I guess Nasa again has trouble sleeping, now that he and Tsukasa have futons next to each other. 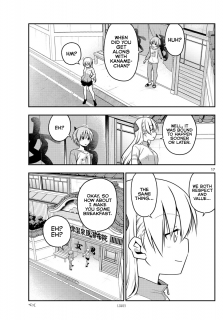 In the end, Tonikaku Cawaii chapter 39 was a lovely chapter, giving us some quality time with Kaname and Tsukasa.